The Type 25 Westfalia Campervan was sold in the US in the 1980s. VW of America needed a “proper name” for the type 25 so ‘van’ and ‘station wagon’ were combined and the Westfalia became the Vanagon. Vanagon models varied and included two versions of a pop top Westfalia camper. 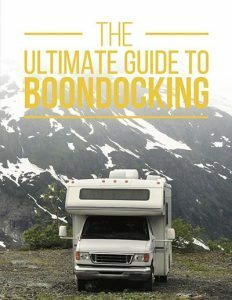 One had a kitchen, refrigerator, stainless steel sink, and rear fold down bench seat with another bed in the pop top that meant the vanagon could sleep four adults. The second version was ‘The weekender’. This was basically a van with no refrigerator, cupboards, stove or sink. A 12v cooler and sink were optional features in the Weekender. 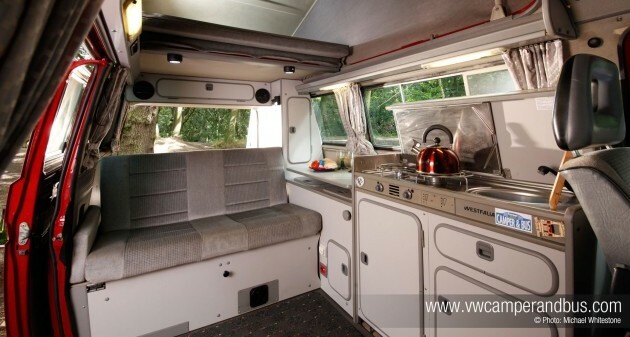 In Europe, the type 25 Westfalia campers included models called the Atlantic and California. 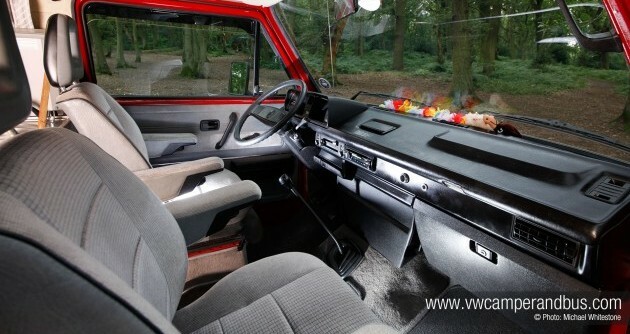 The California had the same upholstery as the Vanagon GL and was manufactured from 1988 to 1990. It was offered as either a diesel of gas, and could be a pop top or high top camper. One of the California models is now owned by Rob and Sarah Bass of Telford, Shropshire. 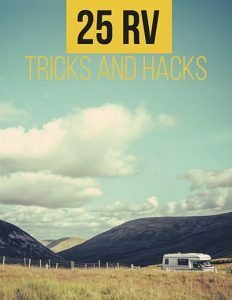 In a recent interview with Volks World Camper and Bus, Rob and Sarah tell the story of their Vanagon. 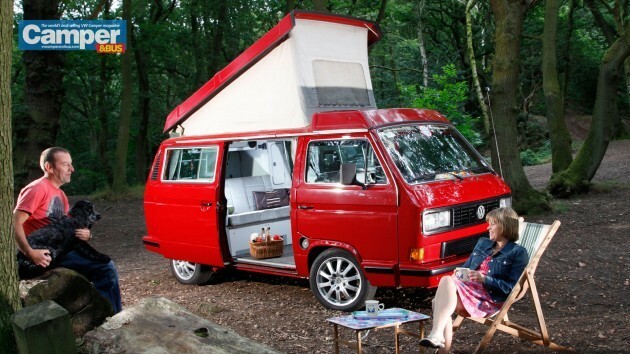 They had thought about owning a camper for several years, and were after borrowing a Type 25 Westfalia from a friend for the weekend, decided it was just what they wanted. After looking for while they finally found one on eBay.”The fridge didn’t work and there was no real history with it, but going on the condition of the interior and how it drove, it seemed to have been looked after.” Says Rob. So they put in an offer and bought it for 6,500 pounds (a little more than $10,000 U.S. dollars). Rob and Sarah are on the road in their camper as much as possible now. They have traveled through the mainland of Western Europe, and driven it to the Channel Islands for the Glastonbury festival twice. They once took a detour so Rob could drive around the Nürburgring. “It was raining and the windscreen was leaking badly, so we put nappies along the bottom of the dashboard to soak up the water. We made it all the way around though, unlike the brand new BMW we saw crash.” Rob tells Volks World. The leak prompted a windshield repair. Two months later the Vangon was back with a new windshield, and repairs to a dented door as well as some other areas on the van. 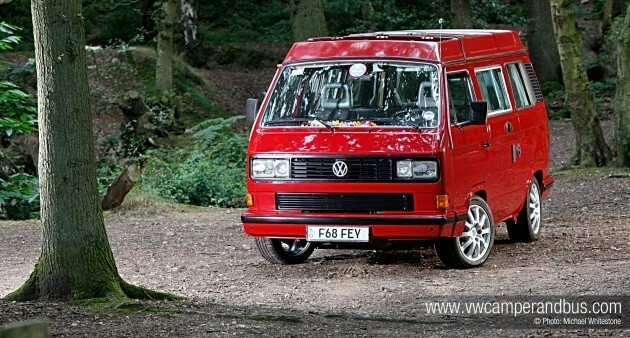 The repairs prompted Rob to take a deeper interest in his campervan, and he set about finding original parts for it. Anything that looked old was replaced with genuine original parts from a company in Germany that carried genuine type 25 parts. He also had the suspension on the Vanagon lowered and replaced the wheels with some from a Porsche Cayenne. 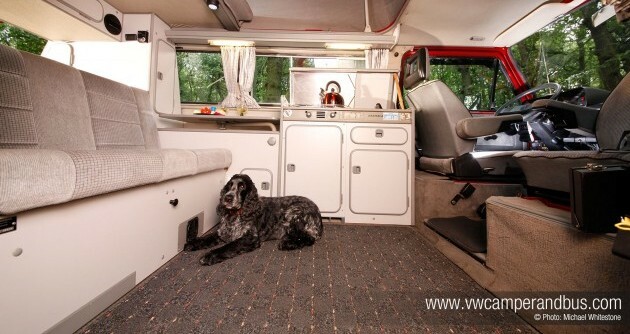 With many new parts and repairs, Rob and Sarah started making the most of their camper. What do you think? 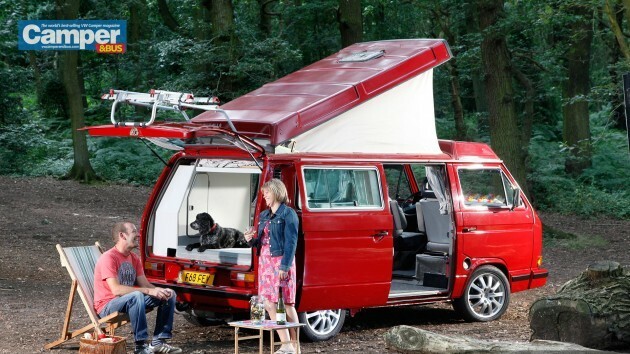 Do you love the Type 25 Westfalia campervan? Tell us in the comment section below.